Depending on how old you are, it might seem a bit disconcerting that a portable CD player is now being proudly displayed at Calgary’s National Music Centre as an artifact from our distant past. But the Panasonic portable CD player is currently on display at Studio Bell, one of the “historic devices” sitting alongside other ancient artifacts such a 1980 ghetto blaster and a Sony Walkman as part of the new interactive exhibition called The Radio Lounge. “I can guarantee you, my kids have never seen one before,” said Jesse Moffatt, director of collections for the National Music Centre in Calgary. Granted, the exhibition travels much further back in time, chronicling the 80-year-plus evolution of personal radio devices. Free to the public, the exhibition is located on the first floor and presented in partnership with iHeartRadio. The oldest piece in the exhibit is a home radio, a relatively massive console that included a radio receiver and record player. 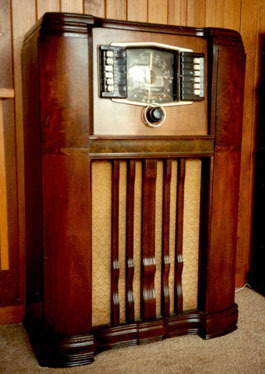 It was made by the Canadian Marconi Company in 1937, a relic from the golden age of radio. From there, the exhibit includes plastic tabletop radios, one made by Canadian Westinghouse in 1948 and another by Canadian General Electric in 1958. There’s the aforementioned Hitachi portable boom box from 1980 and eventually, iPods and iPhones. The Radio Lounge also includes listening stations, allowing iHeartRadio to show off its mobile app that will let visitors stream more than 1,000 radio stations.